Happy Hanukkah!!! Today is the first day of the festival of lights and I wanted to send a little love towards those who celebrate it. I am not going to lie, I don't know much about Hanukkah but I do know that its customary to eat fried foods during the holiday. The oil represents the miracle of the oil that burned for eight days ands.nights when it should have lasted for only one night. That's a cool reason to celebrate.. So a lot of food eaten during the holiday is fried, therefore I must fry, and what better than potato latkes. I don't usually fry anything. But again, I don't think I used as much oil with these as I could have..just enough to cook and not stick. Hey, it's the holidays and this oil had meaning so it's completely a ok to eat a little fried, just make sure to eat lots of good healthy stuff too! I didn't actually use all the potatoes in the picture, but I wish I did. There was the perfect amount for dinner for two people, but I wanted to make a few extra for left overs….there were none. Oh well. I did a matchstick dice for the apples.. I didn't want the apples to be to chunky and I didn't want them to turn into sauce so the match stick worked well. After I diced the apples, I squeezed a little lemon over the top to keep the apple from turning brown. 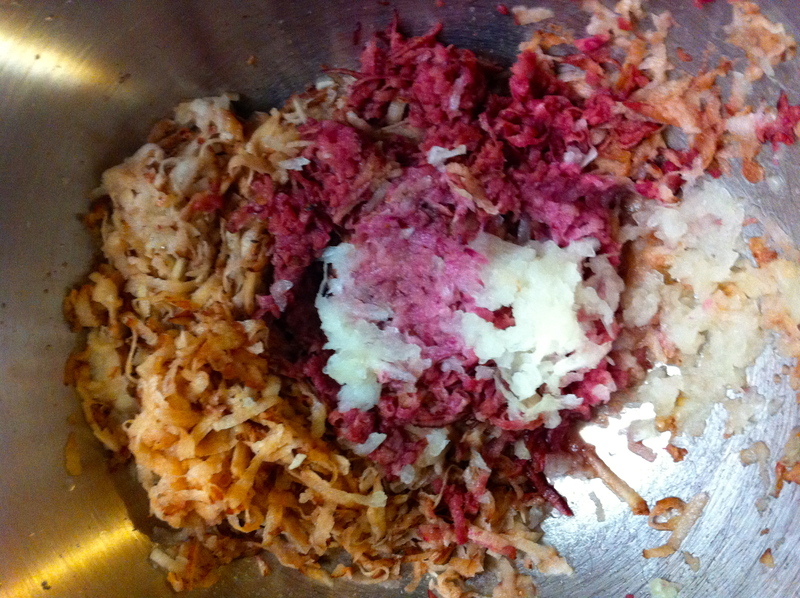 I start grating the potatoes and onion, and whoa! Imagine my surprise when one of the potatoes was purple… I got pretty excited.The color is so beautiful. 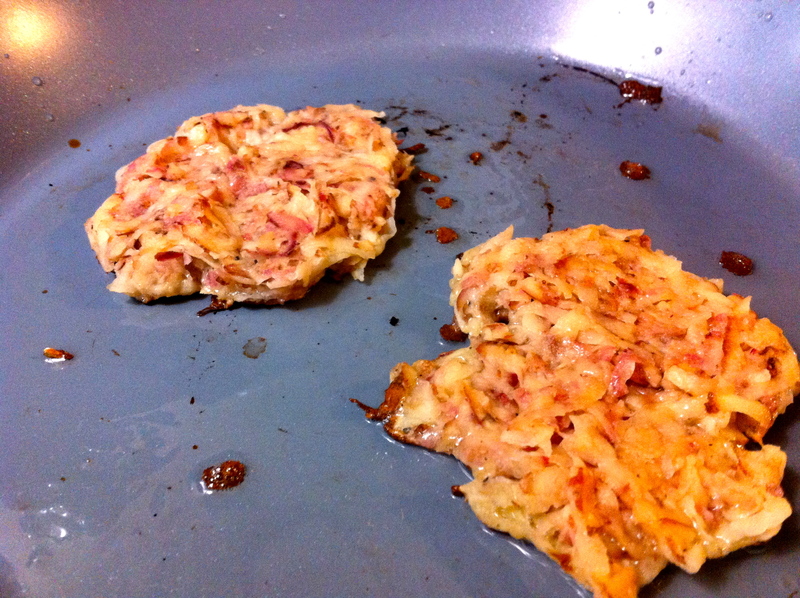 and made the latkes look so nice…It was meant to be. Super squeeze the juices out of the grated potato and onion. If you don't get most of the liquid out, the potato won't crisp up and will fall apart and be and it will be gross. So SQUEEZE! 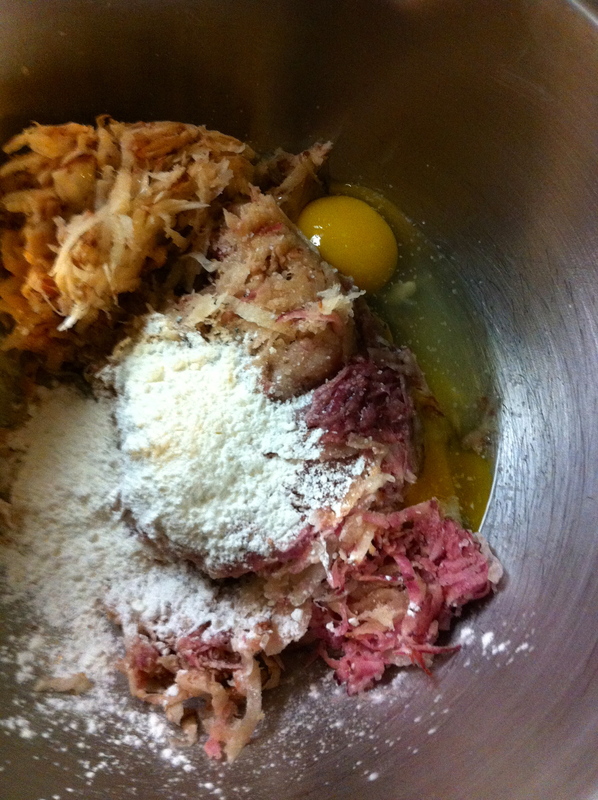 Add in the egg, cornstarch, salt and pepper and mix it on up. Did I mention that I was making these for the mister and the GF sister..No flour, just cornstarch. I think they might have come out even better without the flour…so yeah, these babies are gluten-free. Your mixture is going to start to get a little watery again. Its cool, just squeeze it out with your hands and smash into patties. Enough oil to cover the bottom of the pan on medium heat. Test the oil to make sure its hot enough before sticking the latke n the pan. 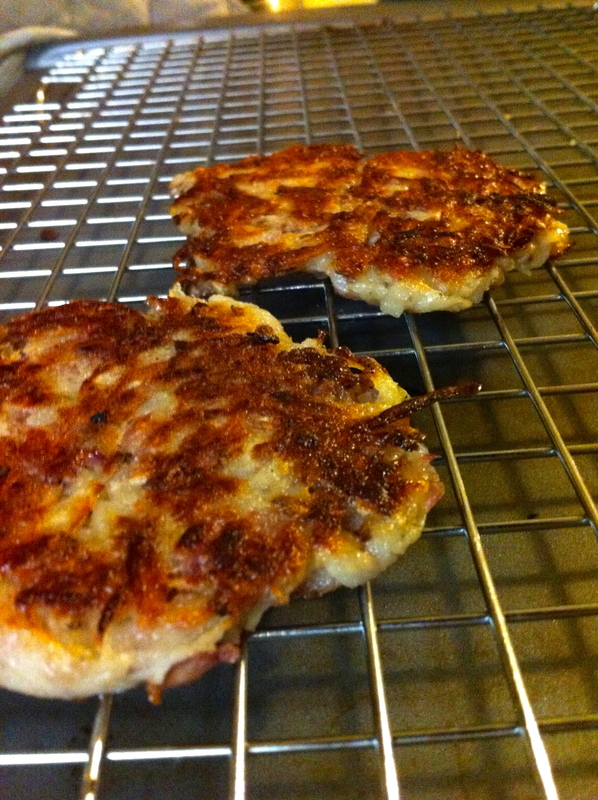 To test, sprinkle water in pan, if it sizzles, its ready.Working in batches, fry each latke on each side for around 5 minutes..you don't want to cook to fast or the inside of the latkes will be raw. I always do a tester and feed it to nick. He's my guinea pig….He said they were awesome.. With every batch made, stick on a wire rack and keep in the oven to stay warm. The rack keeps the bottom from getting soggy on the pan... so use it. Roasted apples are the BOMB!!! Its like eating apple sauce sticks or little bites of heaven(A bit dramatic, but these are so good) I roasted mine for 20 minutes, until they were nice and soft but not completely failing apart. If you are into it, add a touch of cinnamon…I did't this time, but you bet I am going to be making myself a big ol bowl of roasted apples this week, and yes, I will top with cinnamon. 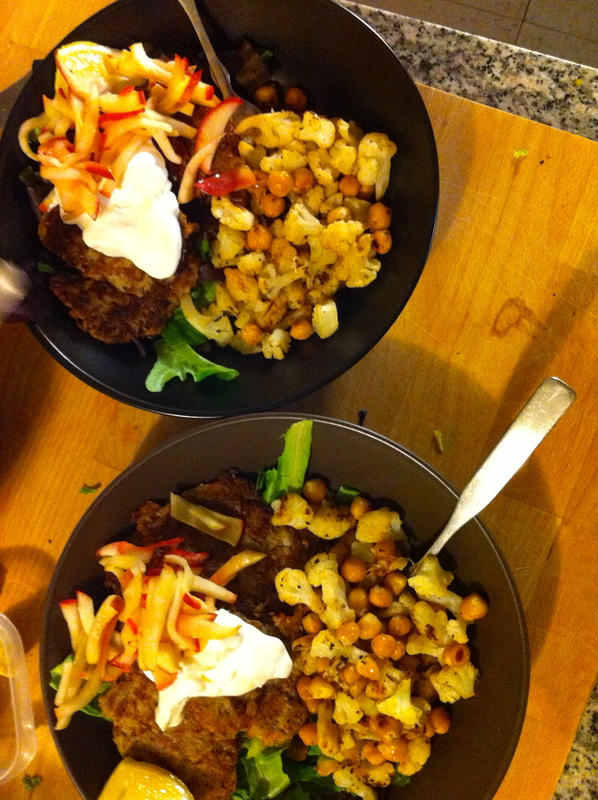 A bowl of apple slaw, sour cream and lemon wedges….I put the latkes on a nice little pile of greens. A very good idea. A dinner worth celebrating! 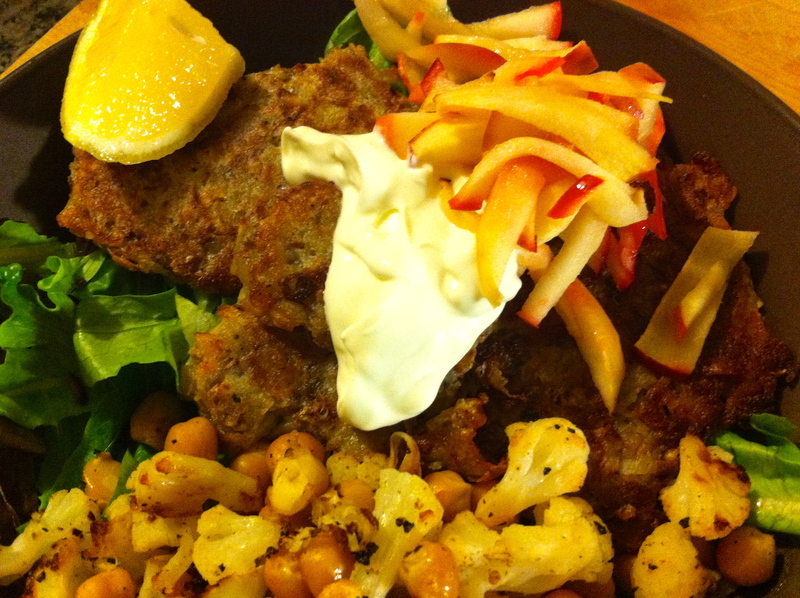 I also served the latkes with roasted chickpeas and cailflower…for more of a meal…( Mini recipe… Cauilfower and chick peas drizzled in olive oil, tossed in salt pepper and garlic, roasted 30 minutes and topped with lemon) A little added veggie and protein….I am looking out for you people. 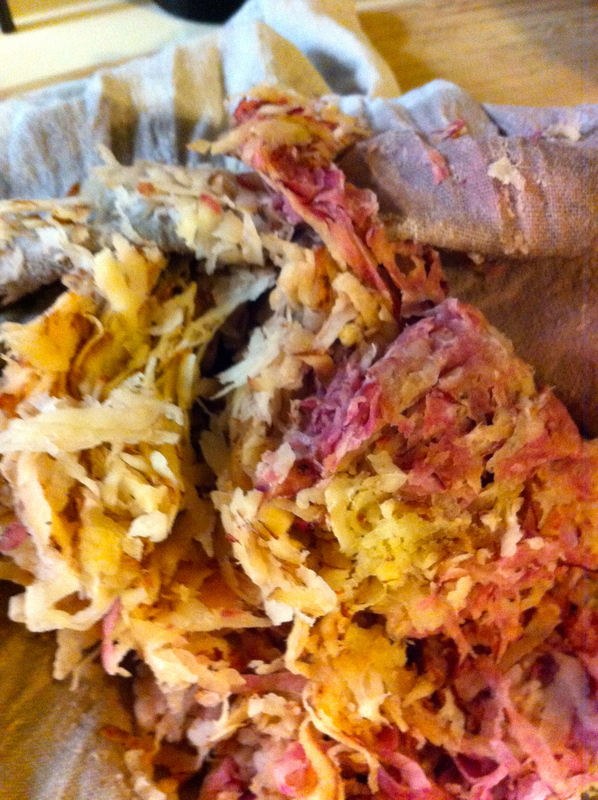 There we have it…my variation on a traditional food. Enjoy your fried pancakes of potato and onion, they are a food worth a celebration. 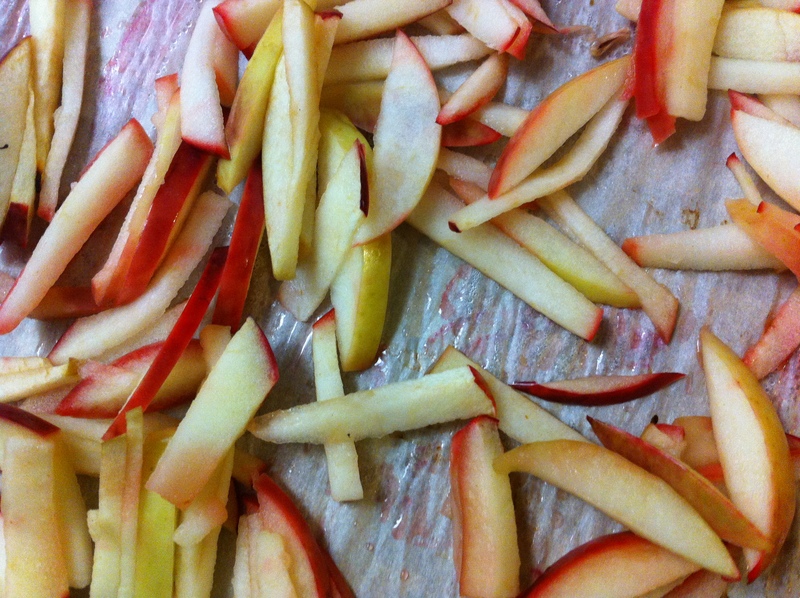 Wash and cut apples into match sticks… Place on a parchment lined baking sheet and stick in oven. 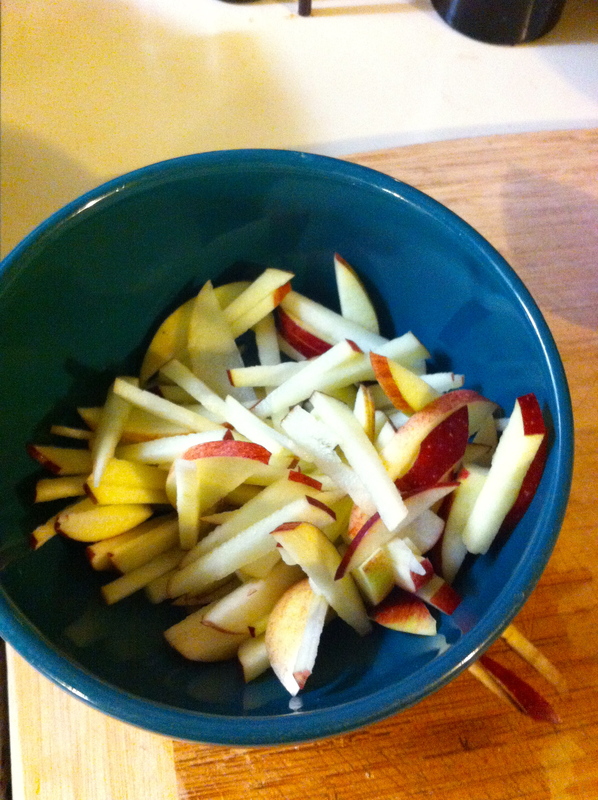 Let roast for 15-20 minutes or until the apple is nice and soft. Remove and set aside. 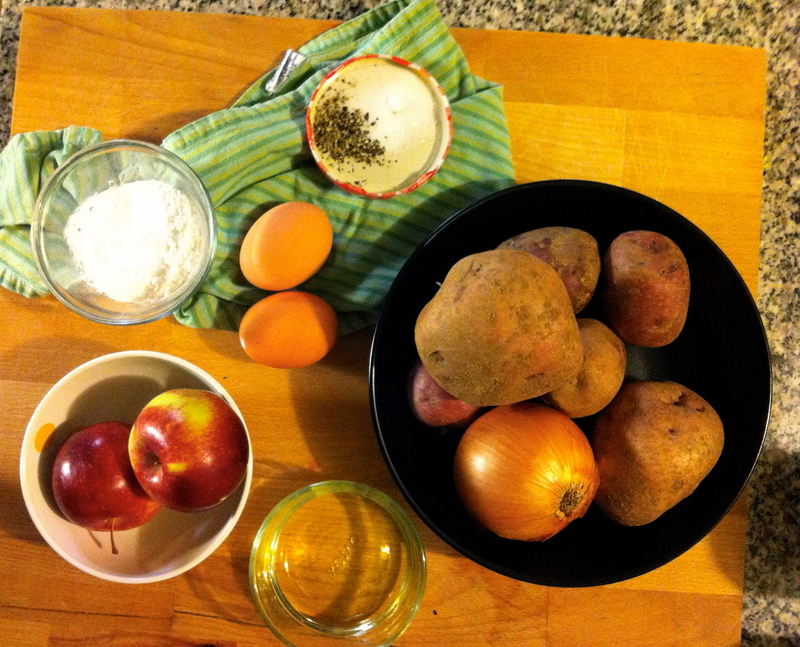 In a large bowl, grate the potatoes and the onion. 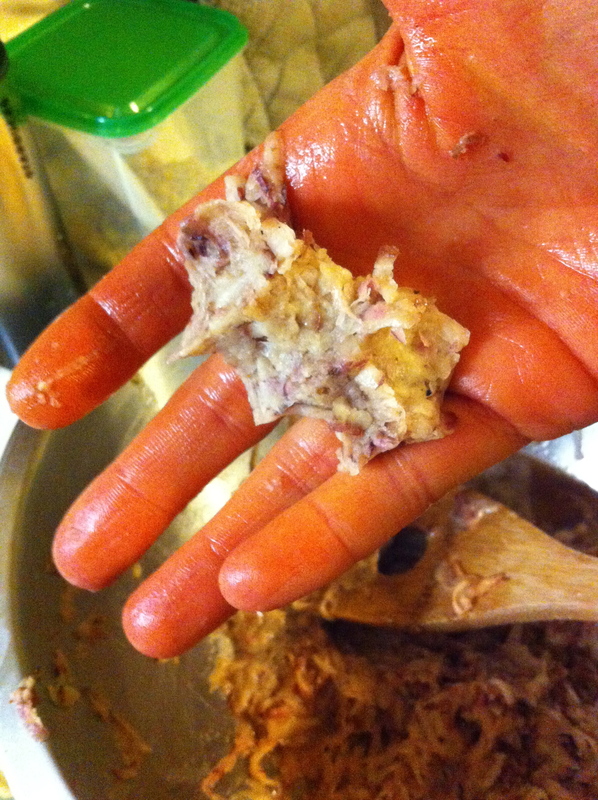 Transfer the mixture into a clean towel and squeeze the crap out of it to remove as much liquid as possible. Return to bowl and add the two eggs, corn starch and salt and pepper. In a large skillet on medium heat, drizzle enough oil to completely cover the bottom..Work in batches and after each batch, add a bit more oil to cover the pan. Once the oil is hot place squashed latkes into oil. Fry each side until crispy and brown, about 3-5 minutes. When fully cooked, place on a wire rack in the oven to stay warm and crisp. When ready to serve, top with roasted apples and a dollop of sour cream. 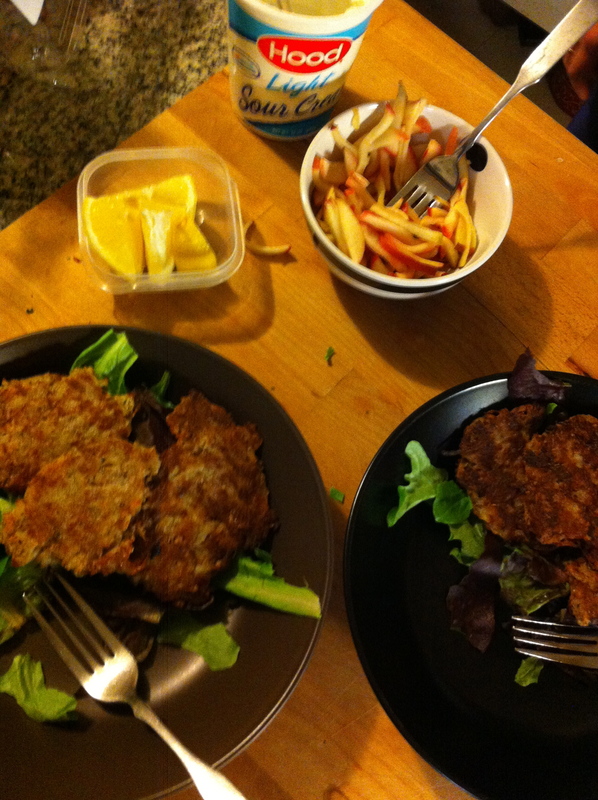 You can serve the latkes on top a bed of greens..Its a good way to make the pancakes more meal like.